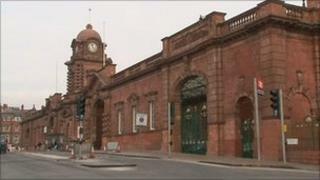 Nottingham Railway Station's car park has been closed as part of £60m improvement works. A 950-space multi-storey car park is being built at the site, along with a new ticket office and waiting rooms. Until it opens in a year's time, the Sovereign House multi-storey on Sheriffs Way is being used as the station's temporary car park. A new concourse is also being built to link up with the planned expansion of the city's tram network. Steve Ray, area general manager for Network Rail, said: "These are the first physical works of what is a significant and important investment for rail passengers in Nottingham. "After many months of planning it is pleasing to see work begin. We will be working closely with East Midlands Trains to make sure that passengers are kept informed and that any inconvenience is kept to a minimum." The entire project is due to be completed by late 2014.